For years, Esther Orr Faulkner captured the essence of Houlton on canvas through her masterful paintings. HOULTON, Maine — For years, Esther Orr Faulkner captured the essence of Houlton on canvas through her masterful paintings. Her work, which included many historical buildings and scenes of nature, was highly sought after and appeared in two calendars with proceeds going to the Aroostook Historical and Art Museum and the now defunct-Southern Aroostook Cultural Arts Project. Some of her best-known paintings highlighted the iconic Boy and the Boot fountain, Market Square and the Covered Bridge in Littleton. Faulkner died on Dec. 26, 2014, but her memory continues to live on thanks to a recent donation to the Cary Memorial Library. One of her sons, Rob, donated a piece from his own collection to the Library on Wednesday, Jan. 30. 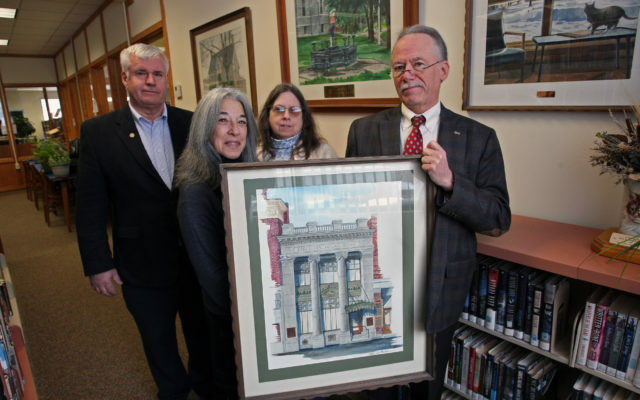 The painting, which depicts the First National Bank of Houlton, represents the 10th piece of Faulkner’s art to be hung in the library. Leigh Cummings of the Houlton Historical and Art Museum said the building was erected in 1907 and is listed on the National Register of Historic Buildings. Rob Faulkner said the painting had been in his home for a couple of years, but he came to the decision that it belonged someplace where more people could view it. Esther Faulkner came from an artistic family. Her father, Forrest Orr, created advertising art and illustrations, and also dabbled with impressionistic watercolors. Many of her early paintings mirrored her father’s influence, but over the years her style changed to become more true-to-life representations of what she saw. According to her obituary, Faulkner taught private lessons to adults at Houlton’s Adult Education Program and also to residents of Madigan Estates Nursing Home, where she became an activities coordinator. She also worked with the SAGE program and the University of Maine at Presque Isle’s outreach program. On canvas, the artist found inspiration in northern Maine’s rugged charm — the old barns, stately brick buildings and the endless miles of woods and farmlands. Away from the easel, she enjoyed being part of Houlton’s community and tried to give back as much as she received. Librarian Linda Faucher said she was thrilled to have the addition to the library’s collection.